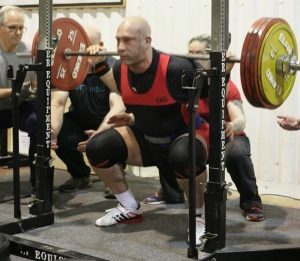 In a previous article I detailed my preparation for the Greater Manchester Championships on 29th April 2018, and I have now recovered enough muscle function to write a review of my day. I shall go into more detail regarding recovery later on, and how this is changing (and getting harder) as the months and years go on. This may well lead onto another article with a title such as ‘Powerlifting for the elderly’. After the ups and downs of the preparation, and the ever-decreasing bodyweight that I was waking up to, I found myself 119.6kg when I got up that Sunday morning. I say morning but it was more like the night before, it’s been a long time since I realised there was a 5.30 in the morning, particularly Sunday mornings. It was strange being up and about when no-one was around – no-one driving past, no-one out in their gardens, no-one making noise outside. Even the TV was geared to the ‘usual’ type of people who are awake at stupid times like this – the (true) elderly, and the people still up from their Saturday nights out. I’m about half way between these two time periods. As I have mentioned previously, I’m used to training at around 6pm and by that time I’m usually pretty mobile but now it’s 5.30am and I have to start warming up in four hours. It should be two in the afternoon – my bodies worried. I decided to calm my nerves with a half-sized breakfast. This was a mini victory in itself – for a long time I thought I wasn’t going to be able to have any breakfast at all, so having this made me feel a little bit better. My breakfast isn’t what you’d call normal – it’s all blended and even at half size it is 600 calories and weighs about 700 grams. I’m good enough at maths to realise that I would now be over-weight, and that an emergency toilet trip or two would be essential before weighing in. Enough of that though for now, I have to get myself sorted. I’d already packed my bag the night before and made sure everything (and spares) was in there and ready, I just had to do some fat person yoga and get myself into the regulation briefs (which are more like a thong the higher above 100kg bodyweight you are), shorts & Taylors Strength t-shirt and I’d be ready to go. I put my Taylors Strength hoodie on and made a point of waking the wife up before leaving the house. 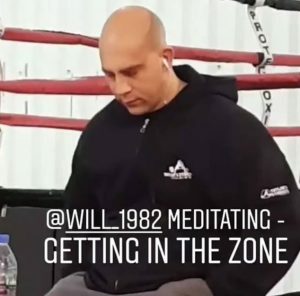 I was taking another competitor and girlfriend (his) over to Manchester with me, which was a positive and a negative – on the plus side it ensured that I left on time as I have a tendency to leave things to the last minute, I can’t put someone else’s day at risk though so at 6.45am I was out the door. On the down side it meant that I couldn’t sing along to 15-year-old dance music whilst driving down the motorway. Probably more of a ‘plus’ than I realised. This turned into a bit of a Taylors convoy as I soon had Jimmy Crosbie in my mirrors charging up behind me, not so worrying when he’s in a car. With Danny Lee in the car with me and Danny Taylor himself in the passenger seat of Jimmys car we were dominating the M62. I hadn’t even seen James Marve Hannon in the back, I was looking for broken down cars along the way so we could all jump out like the A-team. After some questionable hand gestures between cars there was a phone call – Jimmy doesn’t know where he’s going and they would follow me, added pressure. Luckily at 7.15am on a Sunday morning the motorway is pretty quiet and we got to Manchester in 30 minutes, parking in a car park that I used regularly. I’d made the executive decision not to park at Fighting Fit as there was only a few spaces and I didn’t fancy getting blocked in by the afternoon session as we would be trying to leave. The car park we were in looked just around the corner from the venue on the map, as it turned out it was around quite a few corners and it felt like I’d parked in Warrington. We got there for 7.55am though – perfect timing, and I’m sure the brisk walk with heavy bags did us no harm at all. After finding a spot on the mats to put our bags down I got myself to the toilet to try and lose the 200-300 grams necessary to keep me from lifting in the super-heavies as a guest. Jimmy also went and judging by the time he was in there he had a good few kilos to get rid of. I went into the weighting-in room and immediately apologised to the two young girls who were in there as I’d have to take all the clothes off that I was allowed without them calling the police. Success, 119.4kg. This meant that I’d in affect lost about a kilo since leaving the house, it also meant that I was lighter than my previous two competitions going back over a year – my body is a strange thing. I could now have something to drink and eat, although I really wasn’t hungry. It also meant that I could try out something else from a previous article, listening to music. It’s been that long since I’d used my iPod that I’d forgotten how it worked and I was stood there for a good few minutes trying to figure out how to move through the menu. I eventually sorted it out and took myself off to a corner to try and psych myself up, it was at this moment that someone got a pretty un-flattering picture of me – see below. It looks like someone’s chopped the top of my head off – like a boiled egg, and then rested it gently back on top. Also, contrary to some people’s belief (Jonny Zatman), I wasn’t listening to Enya. Then was the bit I’d been dreading, I would have to start squatting… at 9.30 in the morning. My legs and back are my main concern at this time as they take the longest to loosen up through the day, worrying indeed for the squat. Under the bar they felt surprisingly good though so I was happy enough to carry on as normal, not that I had much choice. My shoulders on the other hand weren’t ready for this sort of thing and the closest grip I could get on the bar was half way along the 50mm plate loading section. Warm-ups went smoothly and as I moved up through 70kg, 120kg, 170kg I got to my last warm-up of 190kg. This moved OK but not as fast as we would have liked so we decided to drop my opener from 207.5kg to 205kg. This was a bit of a morale hit as it was the same as I’d opened with last September in the North West Championships and I knew for a fact my squat had got stronger. I was blaming this on the early morning, as I would continue to blame everything that went wrong on this throughout the day. I was 6th on the platform, out of around 12 in my flight and I was happy to be middle of the road. The first squat is notoriously the most nerve-wracking part of the day as getting a lift on the board is vital, and you know this gives you a good hour or so more in the competition without bombing out, the nerves (and early morning…) got to me and I made a rookie mistake – I didn’t take my thumb loops off my wrist wraps. I was reminded of this as I was part way through my lift prep on the platform, not a major issue but just something I shouldn’t have put myself through. My opener of 205kg went OK, not fast but not too sticky, three white lights and I could move on. 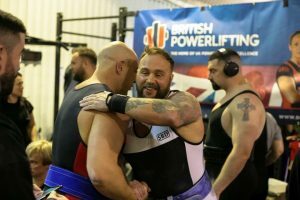 It’s impossible not to compare yourself to previous comps, and I knew that this had moved slower than last time – previously I had gone for 220kg as my second, today the boss put in 215kg which was fine with me. There were some useful coaching cues to prepare me for my 2nd attempt, and these worked as my 215kg felt and looked pretty similar to my opener. I think my ‘fast’ squat is looking slower and slower and I get older and I’m able to use less momentum / rebound and have to rely more on actual strength. 220kg was put in for my 3rd attempt and my mental state wasn’t at it’s best. At Taylors we have a Sports Psychologist we can consult with, I’ll definitely be seeing him more often from now as waiting for my third attempt my brain was flicking between different escape scenarios. I’d failed this weight in training a couple of weeks previously and hadn’t really got close. On the platform I un-racked it and it (as always) felt light, my squat seems to be unusual in the fact the weight feels light at the top of the lift and also at the bottom of the lift. I come out of the hole at 100mph and then hit a brick wall, this happened again in a big way – a third of the way up I came to a standstill and I could see the head referees hand come out to beckon the spotters to take the bar. I wasn’t giving up though, this was usual for me on heavy weights and I was still moving (slowly). In fact I was moving up so slowly that the crowd got into it, started cheering me on and encouraging me but then they all got bored and stopped – with me about 2 inches higher. I eventually finished the lift and got three white lights, I think the embarrassment of potential failure kept me going as much as anything else. Time for a lie down and some sugar. This was my chance to put a good number on the board, unlike squats and deadlifts I seem to be able to bench heavy at any time of the day. This was something I wouldn’t be able to blame on the early morning if it went wrong (I was prepared to anyway though). 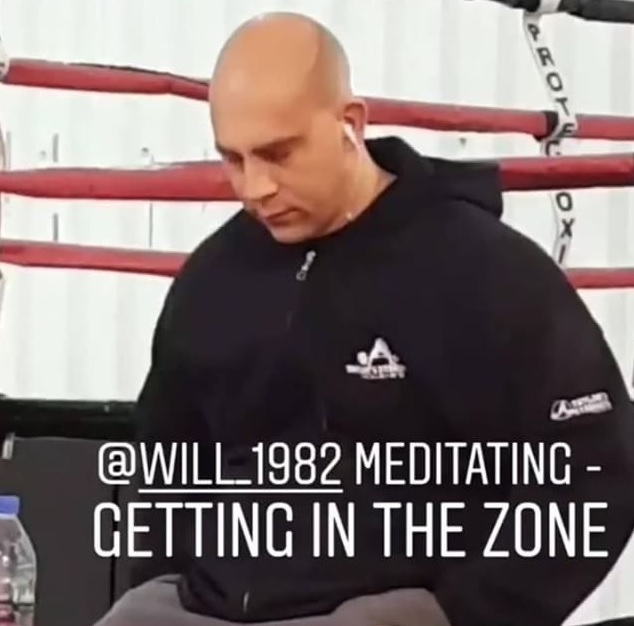 I started warming up and felt good, I had hit a 180kg in training two weeks earlier and missed 182.5kg by about an inch on one side so hopes were high. I went through my warm-ups as usual – bar, 70kg, 120kg but then hit a snag. I use the maximum possible grip that is allowed as per IPF rules with my index finger on the marker rings. This was made difficult by a narrow rack as my hands were catching the hooks as I was re-racking the bar and on my next warm-up of 120kg I took a chunk out of my left hand. Again, positives and negatives – on the downside I now had a bleeding hole in my hand, but on the up side it wasn’t where I held the bar, and it gave me another excuse to use if all went South. My final warm-ups of 140kg and 155kg went well, although a bit rushed. This was my fault though as I should have pushed in the queue more than I had, I was ready for the platform and my agreed opener of 167.5kg felt well within reach. 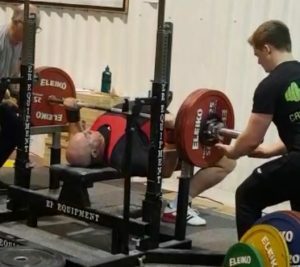 Baring in mind my current comp max was 170kg, and I’d hit a wobbly 167.5kg third attempt at the British Bench Press Championships last year, this was a big improvement. On the platform it all went well, my opener moved OK again, nothing special but it did the job. 175kg was put in by the boss as my 2nd and I felt confident. I’m sometimes unsure what to do in-between lifts, should I stand around, walk around, sit down, talk to people, not talk to people, eat, drink, toilet? I tried to do all of these to cover all bases, although the toilet would have to wait as there was a perma-queue. Some people have superstitions / rituals before lifting and one of mine is usually going to the toilet in-between lifts (squat-bench, bench-deadlift) and it felt odd not being able to do this. Another excuse ready I thought to myself. My second attempt was again, OK – three white lights as before. I had messed my foot position up on this attempt with one foot being too far forward (after having them both too far back and over compensating). 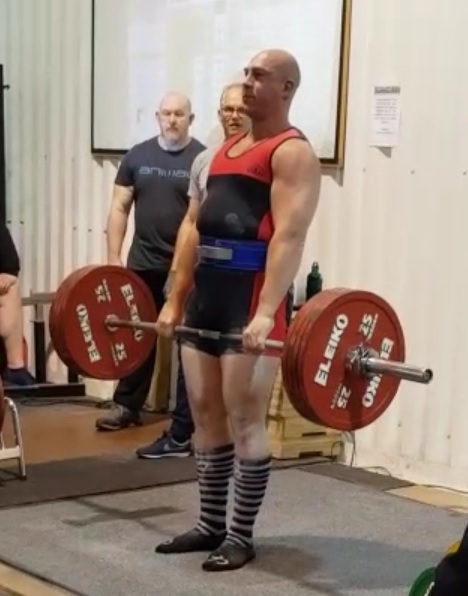 There was talk of going 177.5kg on my third but I wanted a crack at 180kg, and so it was. 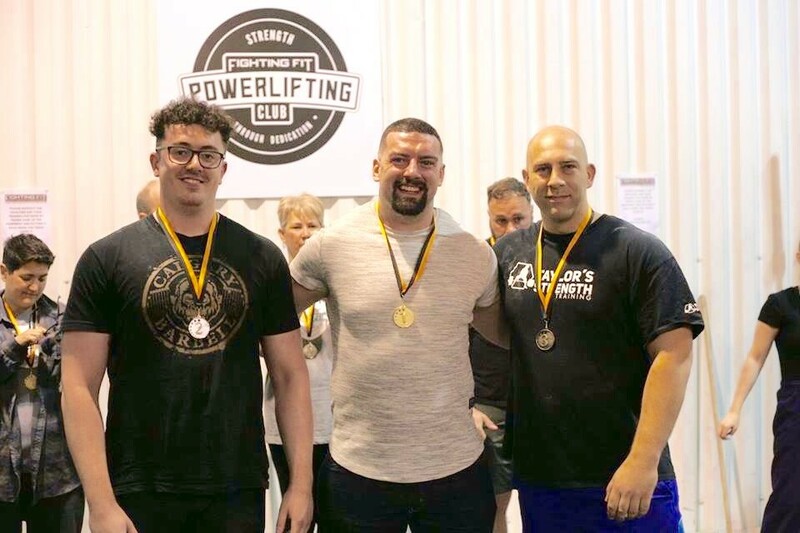 I felt like I’d been building up to this opportunity my whole lifting life, I used to think that 140kg was out of reach and before my first competition two and a half years ago I’d failed 150kg in training before hitting it at comp. The thought of being able to do four plates a side in old money for a paused rep was just fantasy for years. Now thanks to Danny Taylor I was getting on the platform preparing to do just that. Anyone who competes will agree I’m sure, that time goes slower during attempts and this was definitely true for me all day. When I un-racked the weight and on the way down it felt light, the pause felt long (as always, and with any ref), but on the way up felt comfortable. Pretty easy, 180kg on the board. I was now just hoping I’d be able to deadlift more than this. My head was all over the place, I can never get mentally prepared to deadlift and I find myself far too relaxed. I soon found something to get stressed about however as my sub-total was 5kg lower than I thought it should be – I had to run the numbers in my head again. 220kg+180kg should be 400kg I was sure of it, but 395kg was showing on the screen. Had I failed my third bench after all? Had the refs thought I’d given up on my third squat and failed me? I decided the way to resolve this was to interrupt Kim Cowell whilst she was MC ing, not the best idea but it made perfect sense to me at the time. Sorry Kim. After she basically (nicely) told me to do one, I asked the table girls for clarification to which they said they would investigate. Kim would later tell me that a button hadn’t been clicked and it had now been put right. 5kg may not seem like much but I also had another goal for today – qualify for the British Championships in September. I’d not done this before, and I would be right on the limit of qualification (especially after a disappointing squat total) – 5kg could make all the difference. Back to deadlifts. I had decided to take my t-shirt off for these, a big decision and not one that I took lightly. My previous Titan singlet was cut so low that I looked like an 80’s wrestler with no t-shirt underneath so this wasn’t an option back then, I wasn’t big enough or good enough to pull this off – now I had an SBD singlet which covers more of me I felt I could go for it. The other major thing stopping me doing this in the past was that personally I think you have to be a good deadlifter to lift without a t-shirt – something I’m not. Never mind, I was doing it anyway. On top of this I had decided to do two other things for the first time, which I would never advise anyone to do at a comp (doing things for the first time). I was wearing the wife’s deadlift socks, and some deadlift slippers I’d sourced two days earlier, until this I’d been deadlifting bare-foot and not given much thought to this aspect of the day. Warm-ups went fine, but I had the usual feeling of inferiority knowing that my last warm-up was a mere 190kg. For my weight this should be much higher, something myself and Danny are constantly working on. I got fully talc’d up and headed to the platform, a couple of slaps to wake me up and my opener of 207.5kg went smoothly enough. 217.5kg was put up next and I went for a wander around to get myself ready for this. I’d only deadlifted more than this three times before… and it was still early morning I told myself – as if deliberately trying to put myself off. I thought I’d go to the toilet to cheer myself up – queue. On the platform it went up although I got one red light for soft knees at the top. I’d recently converted back to hook grip and was trying a new hip position, this combined with wearing slippers and clown socks gave me enough to think about and I forgot to actually lock my body out at the top – I was also worrying about my grip failing. Anyway, two to one it passed – onto the third. 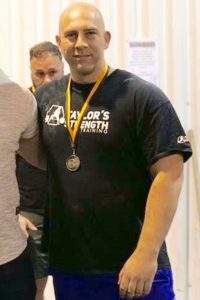 Then I had a new experience – being motivated to deadlift. I was almost as fired up as I was for my third bench press, I wanted some smelling salts to help with the situation but didn’t have any. I decided to rub Deep Heat on my top lip to try and fake the sensation which helped a bit but also made me feel like my nose was constantly running. Maybe it was, too late now though as I was next up. I got a big slap on the back from Jimmy Crosbie which reminded me that I was definitely not wearing a t-shirt… and I approached the bar. This time it all came together and my technique worked well, my grip held up and I made sure I pushed my knees back to lock them out – three whites. A quick cuddle from Danny & Jimmy and I was done and dusted, still at a ridiculously early hour considering. I was genuinely happy with my performance after getting three PB’s (bench, deadlift & total), and qualifying for the British Championships later in the year and I could now relax and eat some cake. Relating this back to the pre-comp preparation I don’t think that I lost any strength during my weight cut, or if I did it was negligible. My squat was down on what I was hoping for but the other two lifts had gone very well and I think this shows that I had done it right. We gathered our things and headed back to the car on the other side of the Pennines. We were missing Mr Hannon, reliable sources told us that he’d gone straight out on the beer in Manchester though so we left – good luck to him. I’m not the most mobile or flexible person in the world and I’m used to not being able to move fully until a few hours after getting up, the day after comp though I felt worse than I had ever felt – parts of my back were hurting that I’d forgotten I had and my legs felt like I’d been swimming in my jeans and was now trying to walk down the street in them. I was in that much pain that I couldn’t even bring myself to get out of my chair at work to get some food, or a drink, or go to the toilet. I was broken. Due to work commitments I hadn’t been able to train for this previous week, which was bad in several respects; I hadn’t de-loaded from the comp properly and I also hadn’t been loosening off my muscles. I’ve never felt so old, and now the thought of lifting any sort of weight seemed impossible to the point that my first training session back I was struggling to squat 70kg. As I said at the start of this, my recovery is getting harder and harder as I do more competitions and as I get on a bit. This is just life and is to be expected however there are things that I should be doing. Our gym also has its own Sports Masseuse / Therapist in the form of Danny Staples, who I should make more use of, and I really need to try stretching now and then. Jimmy Crosbie seems to have found the fountain of youth however – or hides his ailments better than me. The one saving grace of being mid 30’s (as I mentioned to another elderly lifter – Bob Evens at the Manchester comp) is that if we can at least keep our numbers as they are then we might be competitive masters lifters soon. But all in all a good few weeks, topped off with a great competition. I’m now working towards the next with the people of Taylors Strength, and hoping that this will enable me to progress even further.